From the Cumberland Gap to the Atlantic Ocean, this is Virginia Water Radio for the week of December 22, 2014. This week, we feature a history-mystery sound. Have a listen for about 20 seconds, and see if you can guess what kind of water infrastructure being used here is part of Virginia's past, present, and future. And here's a hint: like water itself, these structures may go mostly unnoticed, until they're no longer there, or at least, no longer open. If you guessed a bridge, you're right! That was the sound of a truck crossing the Waterloo Bridge, an 1878, metal-truss bridge over the Rappahannock River at the Culpeper-Fauquier county line. In January 2014, the Virginia Department of Transportation, or VDOT, deemed the bridge unsafe for vehicles and closed it, sparking a debate in Culpeper and Fauquier over the costs and values of restoring and re-opening the historic structure, replacing it with a new bridge, or some other alternative. The debate over the Waterloo Bridge highlights the important role of bridges in Virginia's history, replacing shallow-water fords and ferries as connectors for travel, commerce, military engagements, and communities. In fact, the National Historic Preservation Act of 1966 includes bridges as part of the cultural resources that must be considered for historical significance when federal funds are used in projects. In 2014, Virginia’s over 100,000 miles of streams and rivers intersect with over 57,000 miles of highways and many more miles of unpaved rural roads. The Commonwealth’s bridges range from pedestrian-only, historic wooden structures over small streams [SOUND – 3 SEC - At the Newport covered bridge in Giles County, Va., 12-21-14] to multi-lane steel-and-concrete structures over major rivers [SOUND - 3 SEC - At the New River bridge on Rt. 114 between Montgomery and Pulaski counties, 12-21-14], including almost 21,000 highway bridges maintained by VDOT [not all of which cross water]. 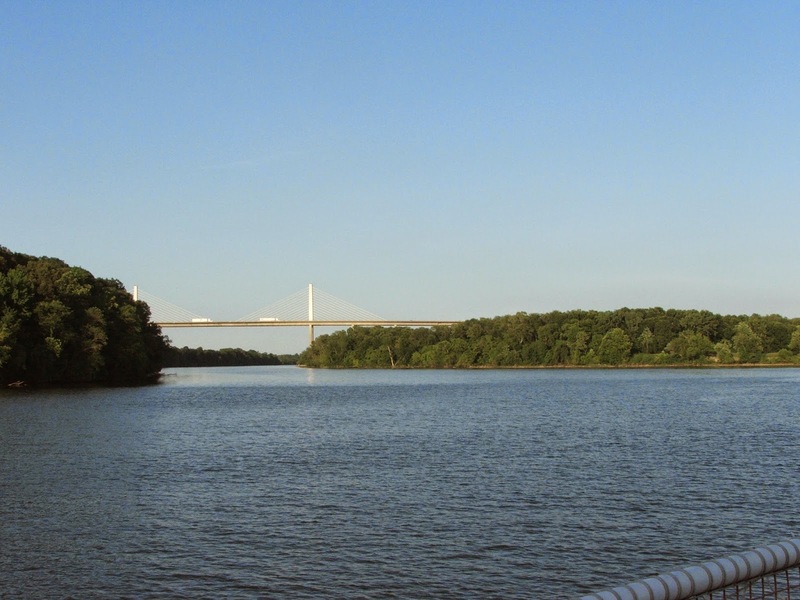 New or old, big or small, igniting debate or mostly ignored, bridges span the story of Virginians and our water-shaped landscape from Wise to Waterloo to Wachapreague. We close with some music appropriate to the Waterloo Bridge, “Rappahannock Rapids,” by Morey Stanton, courtesy of the Rappahannock River Campground in Culpeper County. Waterloo Bridge over the Rappahannock River on Route 613 between Culpeper and Fauquier counties, Va., October 2014. Photo by Julie Bolthouse, used with permission. Metal truss bridge over Catoctin Creek on Featherbed Lane in Loudoun County, Va., June 25, 2010. Historic covered bridge and modern secondary-road bridge over Sinking Creek near Newport (Giles County), Va., Dec. 21, 2014. Bridge over the New River on Rt. 114 on the Montgomery-Pulaski county line. This bridge captures the old and the new: it’s on Pepper’s Ferry Road, named for the ferry that this bridge replaced; and the expansion of the bridge was just completed in 2014, as you can see by the relatively unstained supports on the left of this photo. Interstate 295 bridge over the James River, June 22, 2014. The sound of a truck crossing the Waterloo Bridge was from a video recorded in August 2013 by Julie Bolthouse of the Piedmont Environmental Commission in Warrenton, Va.; used with permission. “Rappahannock Rapids” was composed by Morey A. Stanton for the staff of Rappahannock River Campground, 33017 River Mill Road in Culpeper County, Va.; used with permission of the campground owners. This music was featured in Virginia Water Radio Episode 89 (11-21-11). “Bridge between Fauquier and Culpeper closes Wednesday,” Fauquier Times, 1/15/14. Final Report: A Management Plan for Historic Bridges in Virginia (VTRC 01-R11; 122 pages), by Ann B. Miller, Kenneth M. Clark, and Matthew C. Grimes, Virginia Transportation Research Council, January 2011; online (as PDF) at http://www.virginiadot.org/programs/resources/01-r11.pdf. This report’s Appendix A (starting p. 29) lists the bridges in Virginia eligible for listing on the National Register of Historic Places and for which the Virginia Department of Transportation had responsibility at the time. “Final Report: Survey of Metal Truss Bridges in Virginia” (VTRC 97-R03; 61 pages), by Ann B. Miller and Kenneth M. Clark, Virginia Transportation Research Council, August 1997; online (as PDF) at http://www.virginiadot.org/vtrc/main/online_reports/pdf/98-r3.pdf.Preservation Virginia Announces 2014 Most Endangered Sites List, Preservation Virginia News Release, 4/29/14. Virginia Department of Environmental Quality, “Draft 2014 305(b)/303(d) Water Quality Assessment Integrated Report” (Chapter 2. State Background Information), available online at http://www.deq.virginia.gov/Programs/Water/WaterQualityInformationTMDLs/WaterQualityAssessments.aspx. Virginia Department of Historic Resources, “Review and Compliance,” online at http://www.dhr.virginia.gov/review/orc_home.html. Virginia Department of Transportation, “Bridges in Virginia,” online at http://www.virginiadot.org/info/Bridge.asp. Virginia Department of Transportation, “Virginia’s Highway System,” online at http://www.virginiadot.org/about/vdot_hgwy_sys.asp. Waterloo Bridge among Va. “most endangered” sites, Fauquier Now, 5/1/14. Waterloo Bridge restoration estimated at $1.8 million, Fauquier Now, 10/2/14. Virginia Water Central News Grouper posts on news, events, and information resources relevant to the Rappahannock are available online at http://vawatercentralnewsgrouper.wordpress.com/?s=Rappahannock+River. Virginia Department of Game and Inland Fisheries, “Rappahannock River-Upper,” online at www.dgif.virginia.gov/fishing/waterbodies/display.asp?id=170. Episode 71, 7/11/11 – “Rappahannock Running Free,” by Bob Gramann (on the removal of Embrey Dam from the Rappahannock just above Fredericksburg, Va., in 2004). Episode 89, 11/21/11 – “Rappahannock Rapids,” by Morey A. Stanton (on the Rappahannock River watershed). This episode may help with Science Standards of Learning (SOLs) for Living Systems in Grade Six and for Earth Science; and with Social Studies Standards of Learning (SOLs) for Virginia Studies, World Geography, and Virginia and United States History.